As the Bilby is a rare and endangered species, you have almost no chance of seeing one in the wild. Fortunately several zoos, sanctuaries and wildlife parks have Bilbies on display. The park is located next to Tallebudgera Creek on West Burleigh Road, West Burleigh on the Gold Coast. It is open 9am to 5pm every day of the year except Christmas Day. The nocturnal house opens at 11am, but there is an introductory talk at 10:50am. For more information visit their website (see the Bilby Links page). 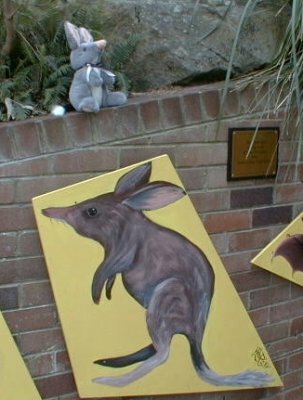 There were 4 female Bilbies in the nocturnal house when the Australian Bilby Appreciation Society visited the park in December 2000 - we were very impressed with this Bilby display. You can see some video clips of these Bilbies on the Photos and Videos page. Bilby tours are run between April and October on Sunday, Monday, Wednesday and Friday nights at 6:00pm. Ring (07) 4654 1255 to confirm. Visit the Save the Bilby Fund website for more information. 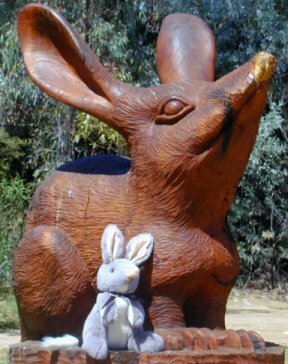 The Australian Bilby Appreciation Society visited Charleville in December 2000 and had a great time - find out about the Save the Bilby Fund and the captive breeding program at Charleville on the Save Bilbies page. The sanctuary is located at 28 Tomewin Street Currumbin, just off the Gold Coast Highway. They are open every day of the year except Christmas Day. Open 8am to 5pm (except ANZAC Day - open 1pm to 5pm). For more information visit their website (see the Bilby Links page). 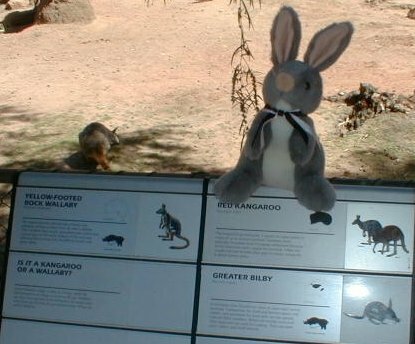 There was a single Bilby on display at the sanctuary when we visited in December 2000. The zoo is situated on Sydney Harbour at Mosman. Open every day of the year from 9am to 5pm. For more information visit their web site (see the Bilby Links page). We last visited the zoo in March 1999, when there were three Bilbies in the nocturnal house at the zoo. You can see some photos and video clips of these Bilbies on the Photos and Videos page. The zoo is on Frome Road next to Botanic Park. Open every day of the year from 9:30am to 5pm. For more information visit their website (see the Bilby Links page). We last visited the zoo in November 1998. 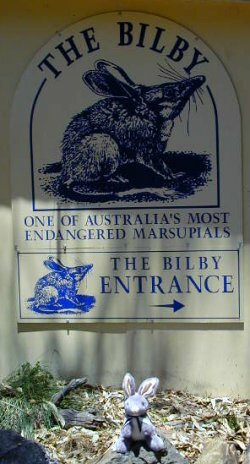 Unfortunately the Bilbies were in the same enclosure as the kangaroos (see picture above) rather than in the nocturnal house. 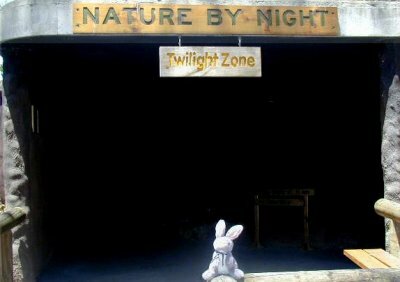 As Bilbies are strictly nocturnal, there was no chance to see them. We have been informed that the Bilbies are now in the nocturnal house. The zoo is on the Princes Highway in Monarto (near Murray Bridge, approximately 70km east of Adelaide). Open every day of the year from 10am to 5pm. For more information visit their website (see the Bilby Links page). Bilbies are being bred in captivity here and are on display in the Visitors Centre. The Sanctuary is located in the Adelaide hills, just 25 minutes from the CBD. For more information visit their web site (see the Bilby Links page). The park is on Larapinta Drive, only 10 minutes drive from the centre of town. Open daily 7:30am to 6pm (except Christmas Day). (08) 8951 8788. For more information visit their web site (see the Bilby Links page). Bilbies are on display in the nocturnal house. The park is at Berry Springs on Cox Peninsula Rd, 57km south of Darwin. Open daily 8:30am to 6pm (except Christmas Day). Phone: (08) 8988 7200. For more information visit their web site (see the Bilby Links page). Bilbies are on display in the nocturnal house.